One of the famous and sacred places in Central Asia is mountain settlement Arslanbob. 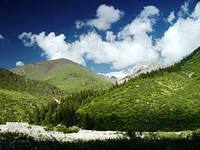 This picturesque place is famous for its walnut-fruit forests, located on the south of Kyrgyzstan, its area is 608,000 hectares. Arslanbob is at an altitude of 1,500 metres above sea level. 130 species of trees and bushes grow in this amazingly beautiful place: walnut, apple, currants, pistachios, almonds, and many others. The main attraction of Arslanbob is walnut. Some of these trees bear fruits up to 400 kg per year. Downhill skiing and tourism are well-developed here. There are many sunny days in winter. It is fabulous and picturesque place is famous for beautiful waterfalls, caves and sacred lakes. 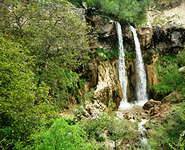 On the way to Dashman (3 kilometres from Arslanbob), you can visit the waterfall Chiltan. Its water falls from a height of 30-35 metre. Here you can also take a tour to the Great Falls, located at the foot of the mountain Baubashat. Height of this waterfall is 70-80 metres. There is a deep canyon where you can see wild pigeons. There are also tourism and recreation camps, sport camps and summer camps on the Arslanbob territory. Walking along forest groves and bushes, you will reach the beautiful "Tourist Falls", located at an altitude of 2500 metres. There are no forests with thickets, but here you can see currant bushes, apple and cherry plum trees. Having arrived in Kyrgyzstan, you should visit wonderful and picturesque gorge Arslanbob, where you can relax and have a rest from city fuss, admiring the beauty of this fabulous place.